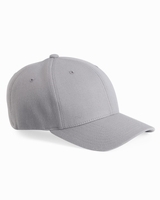 Flexfit - Structured Wool Cap (6477) 15 colors in a fitted, six-panel, mid-profile look, structured with buckram backing. 83/15/2 acrylic/wool/spandex (White is 100% acrylic). Permacurv visor, silver undervisor. Sewn eyelets. Sizes: S/M (6 3/4"-7 1/4"), L/XL (7 1/8"-7 5/8").